You may have thought that your administrator has it in for you, but have you ever had an administrator who’s literally out to get you? As in, actually trying to kill you? Well, that’s what “Carl” was dealing with. He had been nothing but loyal, dedicated, and passionate. But his administrator became jealous and started plotting against him. He undermined him whenever he could, made horrible decisions, gave him the worst assignments, and literally plotted against him. But what did Carl do? Well, surprisingly, he didn’t call up his union and go on a crusade to defend his rights. In fact, he did something quite different. And maybe we should, too. Take your burden to God & leave it there. Too often we take our burdens and cares to God and tell Him all about them but then we get up from our knees and pick our burden right back up. But when we do that, we’re missing the whole point! God wants us to give Him our burdens and leave them there. That means we decide to trust Him with everything involving our difficult administrator – what decisions they make, how we’re going to implement them, what they think of us, how much time they waste – everything! So stop right now and give your burden to God in prayer. And then determine to leave it at His feet, placing Him in charge of the situation and determining to simply follow however He leads. We all want to be respected, and we all want our administrators to think we’re doing a great job – to give us great evaluations. But the stress of worrying about what they think will do no one any good – least of all you. Remember that you are working for God, not man. And realize that when we worry about what they think, it’s really just our pride rearing its ugly head and making sure we look good. And, yes, I know admins have a lot of power over us, and you may be concerned about your raise or your evaluation or even whether or not you’ll be re-hired for the next school year. But remember that God is the one who is ultimately in control of all this, not your administrator. If anything “bad” happens to you because of them, it is part of God’s plan. You can trust and rest in His promises, even when they come from a frustrating source. So let go and determine to stop worrying about what they think of you. You’ll be amazed at the burden that rolls off your back. The world is constantly telling us that we deserve to be treated well and that life should be as pleasant and carefree as possible. But the Bible paints quite a different picture. God says that our lives are meant for His glory, not our own pleasure. He never promised life would be easy but He always promises to be our strength, our guide, our rock, and our rest. He promises that everything He allows into our lives is for a reason and that He will work all of it together for good if we let Him. Too often we focus on how unfair the situation is instead of leaning into God and learning the lessons He wants to teach us through the situation. A critical, micromanaging, or unreasonable boss can be used by God to refine our character, teach us His truths, and bring us closer to Him. But He can only do this when we stop complaining about how awful it is and surrender the whole situation to His care. We are often so sure our administrator has made the wrong decision or acted inappropriately. And maybe they have. But it’s also possible that we don’t know all the details. You know how hard your day can be and how you can unintentionally snap at that poor student who happened to ask you the same question you just answered 18 times? Well, sometimes our admins have those moments too. I’m not excusing their behavior, but I’m saying that we can choose to give grace. That we can choose to remember how difficult their job must be and keep in mind that they’re probably dealing with some pretty tough situations that we know nothing about. The same thing holds true for policies. Sometimes admins make bad policies. But sometimes there are other considerations that we don’t know about. The policy seems bad from our end but we simply don’t have all the facts. Bottom line – the more we choose to give grace and the benefit of the doubt, the more we release ourselves from the burden of judging them. And that, my dear teacher, is good for everyone. Look for creative ways to deal with difficult demands. When an administrator places a requirement on us that we find either difficult or unreasonable, we have a choice. We can get upset and frustrated and grumble our way through it. Or, we can come up with a creative solution that makes it work. You might not think there’s a solution out there but chances are there is. Let me give an example: When I taught math I used to take off points for students who didn’t show their work, use graph paper for graphing, etc. One day my administrator called me in and said this wasn’t acceptable and that I couldn’t take off points anymore. What I came up with ended up working even better than my original plan. I decided to give them their full credit but require them to redo the homework the correct way. Presto – problem solved. That’s just one example, but the point is that there is often a way to make the requirement work. So look for that creative solution. Talk to other teachers and ask how they do it. Keep thinking and praying until you find a way to make it work. When a poor conversation has you in a tizzy, take a breath and remember that you’re here for your students. Think about them, do your best for them, and focus on all the things you CAN control to do the best job you can for them. Find others who will support you. If your administrator isn’t giving you the help and support you need, find someone else who will. This may be another teacher or administrator at your school. Or it may be someone you meet online. I talk here about how to set up your own teacher support group. And our Facebook discussion group is a great place to network and find support as well (click here to request to join the group). When you inevitably must have a conversation with your admin, always seek to approach it from a win-win perspective. This means starting from the realization that you have the same goal and are on the same team, even when it doesn’t feel like it. 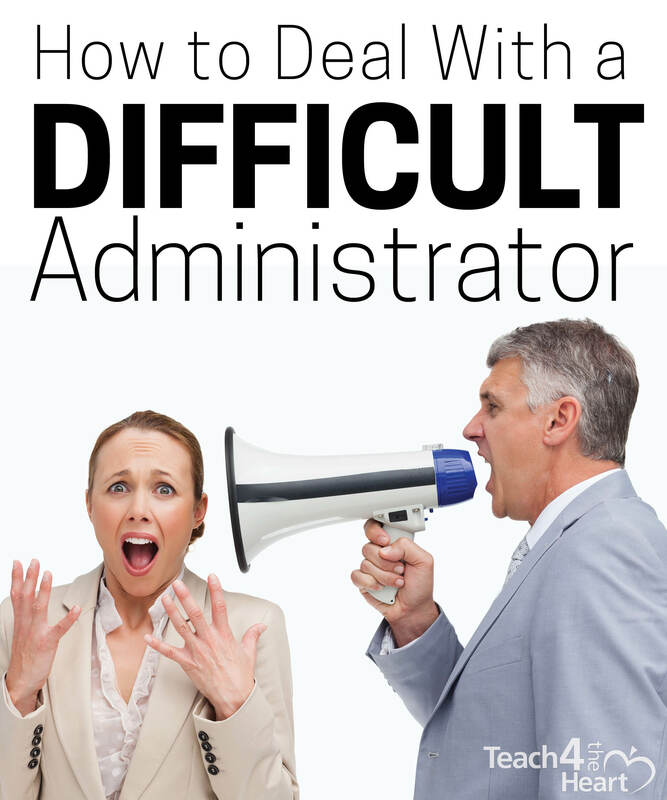 Often when you have a frustrating administrator you’ll start to see the situation as you vs. them. But that doesn’t help anything. Instead, choose to remember that you both want what’s best for the students, even if you disagree about how to get there. Sure we can go into a meeting and spout off all our pent-up thoughts, but that may or may not go over so well. Instead, start your conversation by trying to understand your administrator’s point of view. Ask questions and genuinely listen to their responses. You’ll often discover that there’s been some type of misunderstanding or that what you thought they meant wasn’t what they meant at all. Either way, you’ll gain valuable understanding that will allow you to present your viewpoint in a way that is relevant to them and more likely to resonate with them. When you seek first to understand, then to be understood, you’ll be amazed at how differently the conversation flows and the real progress you can make. No matter what happens, determine to pray for your administrator – and not that they will get fired. But that God will work in their lives and give them wisdom. And as you pray, leaving your burdens with Christ, determine to surrender to His plan and trust Him no matter what. We may not understand why He is allowing this, how this could possibly be part of His plan, but we can absolutely rest in His arms, knowing that He is indeed in control, that He loves us, and that He will use even this for His purposes. That’s what “Carl” did. He determined to trust God and leave the situation in His hands. When given the opportunity to ruin his horrible administrator, he did nothing, refusing to take into his own hands what belonged only in God’s. And do you know how it all turned out for “Carl”? Well, he became one of the most famous kings in history. Because Carl’s real name is David. And God was using all those difficulties to prepare him to rule His people well. So when you’re frustrated, discouraged, ready to call it quits, remember that God works in mysterious ways and surrender to what He wants to do in your life as well. And while you most likely will never be a king, you never know what He is preparing you for. Are you struggling to stay encouraged and motivated as a teacher? Join us in Teach Uplifted, where you’ll discover how to renew your passion for teaching by finding joy and peace in Christ. 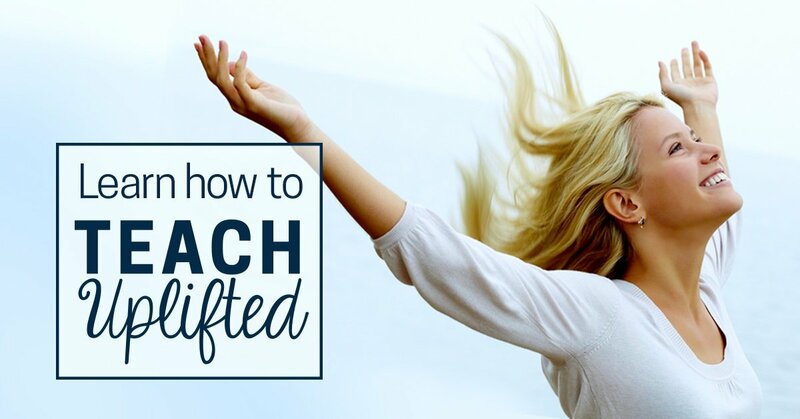 Find out more about Teach Uplifted. p.s. Know you’re going to need to read this again & again? (because, y’know, it’s a day-to-day struggle for realz…) Pin it to your Teaching board so you can easily find it. Pinned! Sound, mature advice, wisely put. From my own experience, I have found that, as you say, key points of conflict resolution are giving our worries to God, remaining objective, and seeking to truly understand the other person. Thank you! This is advice is spot on for I have lived this out and can testify to the goodness of our God! I have suffered tremendous persecution that brought me to my knees in prayer day in and day out for an entire school year. It also brought me, thankfully, to a wonderful Christian counselor. She taught me exactly all that you have shared. I spent a tremendous amount of time studying the book of 1 & 2 Samuel, Joseph and Job stories. I fasted and prayed God’s glory in all of this. No doubt I still hurt and have worked on not letting bitterness take root but I would not trade one day of the pain because it has brought me closer, so much closer, in my relationship with our sovereign God. Tears fill my eyes and joy fills my heart when I think about how much God loves me and everything is for His glory.